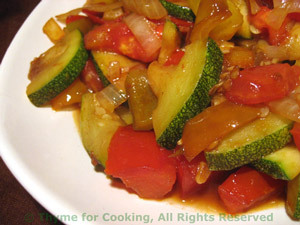 Sautéed Courgette (Zucchini), Pepper and Tomato, Thyme for Cooking easy summer sides. We like smaller zucchini (courgette). They have a better flavor. This is more of a 'summer mélange' than just another zucchini dish. Slice zucchini in half the long way, then in slices the short way, about 1/4" (1cm) thick. Roughly chop pepper, onion and tomato. Add garlic, zucchini and sauté until zucchini is just tender, 5 minutes longer. Add tomato and sauté until it starts to soften, 2 - 3 minutes. Stir in soy sauce, vinegar, and serve.